The mandible is perhaps one of the most interesting bones in the body because of its multi-task involvement in biting, chewing, swallowing, speech, breathing and facial expression; and functional connections with the bones of the cranium, malleus, hyoid, sternum, scapula and cervical spine. It is characterized by a set of teeth that project upwards and inter-cuspate with those from the maxilla and a pair of synovial joints that have caused much controversy (Luce, 1889). The temporo-mandibular joint (TMJ) is a characteristic feature of mammalian development (Anthwal et al. 2013) but the least understood, and the high incidence of symptomatology associated with it remains a cause for concern. It is estimated that up to 25% per cent of the population suffer from symptoms linked to TMJ dysfunction, with most occurring between the ages of twenty and forty years and a predominance of women to men in an 8 to 1 ratio (Ingawalé and Goswami, 2009; Murphy et al. 2013), but only a small proportion of these reveal pathological changes within the joint. Typical symptoms include pain and tenderness around the jaw, face and head; abnormal jaw motion with clicking and popping; tinnitus; neck pain; stiffness; swallowing and breathing difficulties; but our understanding of the aetiology behind these symptoms is far from complete (Singh and Detamore, 2009; Fricton, 2014). While it is recognized that a balance between the occlusal surfaces and both TMJ’s is essential in maintaining normal function (Woda et al. 2001), the therapeutic use of oral splints (Fricton, 2004), manual therapies (Cuccia et al. 2011; Dommerholt, 2006) and exercises in reorganizing neuromuscular reflex activity is still hotly debated and, in certain respects, such treatments have become more of a clinical art form (Grünheid et al. 2009). At the more extreme end of the scale are the surgical techniques used to replace damaged discs and articular surfaces that follow from acute injury, prolonged micro-trauma or pathology, and for which surgeons are crying out for more basic science (Detamore et al. 2007; Ingawalé and Goswami, 2009). The failure of implants and prostheses that are unable to deal with the mechanical demands placed on them can have disastrous consequences (Sinno et al. 2010). One of the reasons for the lack of knowledge about this joint has been the difficulty in acquiring information (Koolstra, 2003). The joint is not easy to access, particularly in animals where it is concealed behind the temporal arch, and the movement of each half of the mandible must always be considered in relation to the dentition and that on the opposite side of the skull. The virtually complete absence of reliable in-vivo data on joint loading and muscle forces is due to practical and ethical constraints; and the contribution of certain muscles, ligamentous and fascial structures to joint mobility and stability remains controversial. Even the results of cadaver experiments can only be approximations. While theoretical analysis and increases in computer power enable quite sophisticated finite-element models (FEM) of the TMJ to be produced, they require most of their input values to be estimated (Koolstra, 2003; Singh and Detamore, 2009); and although the short-comings of such models have been recognized, their findings are frequently used to estimate the input values for other models and a sort of merry-go-round of misinformation can develop. Some appear to be more of an exercise in computing skills while the significance of others in furthering understanding of TMJ dysfunction is debatable. In fact, the constant search for ‘just a bit more data’ may be missing the point if the biomechanical theory on which these models are based is itself lacking. Current biomechanical knowledge is now over three hundred years old and has remained essentially unchanged since Borelli (1608-1679) compared the anatomy of human movement with man-made machines of the day (Ethier and Simmons, 2007); but biology is not constrained by the limitations of classical mechanics. Borelli’s system dominated because no one had come up with a better explanation for what could be observed; but its application to biology has been challenged (Levin, 1982, 2002, 2006; Lighthill, 1986). Standard biomechanical theory depends on a lever system that inherently generates problems in a biological context and does not have a satisfactory model to explain how the TMJ could be routinely decompressed, or ‘pulled apart’; and it is considered that this inadequacy has restricted our understanding and necessitates a re-opening of the decades-old debate on joint loading. 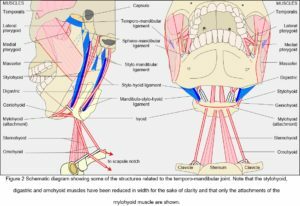 A revision of basic TMJ anatomy is now given with a review of the controversy surrounding its mechanics and important issues relating to the control of mandibular motion, and is followed by a reassessment of classical biomechanical theory and methods, and the introduction of a new model. From an anatomical perspective, each TMJ is classified as ginglymo-arthrodial (sliding-hinge) with articular surfaces, a disc, fibrous capsule, synovial membrane; and associated ligaments, fascia and muscles. It is one of the last diarthrodial joints to appear in utero and remains considerably underdeveloped at birth thus making it more susceptible to peri- and postnatal insults (Bag et al. 2014). The joints are unique in that they enable the mandibular condyles to both rotate and translate antero-posteriorly, although it is the complex arrangement of muscles and connective tissues that enables them to move in every direction of space. The cranial part of the TMJ is provided by the articular glenoid fossa of the temporal bone, with the mandibular condyle lying beneath (Fig. 1). Anteriorly, the bone of the glenoid fossa gives rise to the articular eminence (AE), and posteriorly it is bounded by the articular ridge, with its articular surface extending anteriorly beyond the summit of the AE and onto the pre-glenoid plane, and posteriorly as far as the head of the squamo-tympanic fissure. The head of the condylar process is also covered by an articular surface, and uniquely for a synovial joint, both articular surfaces are covered by fibro-cartilage (rather than hyaline) that is capable of extensive repair and remodelling (Singh and Detamore, 2009; Tanaka et al. 2008). The disc is a complex structure composed of dense fibro-cartilage that lies between the condyle and glenoid fossa, with a transversely oval shape consisting of a thin and avascular central zone surrounded by a much thicker annulus (Tanaka and Van Eijden, 2003) (Fig. 1). The triangular anterior band of the annulus is attached to the capsule, AE and condylar neck, while medial and lateral ligamentous attachments to the corresponding poles of the mandibular condyle maintain a close relationship and sometimes blend with the capsule (Christo et al. 2005; Murphy et al. 2013). The posterior band continues into the retro-discal tissue as a bi-laminar zone that consists of a superior fibro-elastic layer attached to the post-glenoid process and squamo-tympanic fissure, and an inferior fibrous layer attached to the posterior condylar neck, with loose elastic fibres between these two layers richly innervated with blood vessels and nerves and also attaching to the disc. These retro-discal tissues are folded in an accordion-like way that opens out during mouth opening, and it has been suggested that the elastin fibres and their attachments augment disc retraction during mouth closing (Bag et al. 2014), although this has been questioned (Christo et al. 2005). During mouth opening, the venous plexus within the retro-discal tissue can expand up to five times its original volume and induces a cyclic change in pressure that ‘pumps’ capillary blood to the capsule and synovium, thus enhancing the production of synovial fluid (Wilkinson and Crowley, 1994). The fibrous capsule encloses the joint and is attached to the disc and articular boundaries of the temporal bone and mandibular neck (Christo et al. 2005). It is highly vascularized and innervated, and lined with synovial membrane on its inner surface, with the secretion of synovial fluid lubricating the joint and providing the nutritional and metabolic needs of the articular tissues (Hill et al. 2014; Tanaka et al. 2008). While the capsule, disc and articular cartilages are connective tissue specializations intimately associated with the joint, so the ligaments and fascia provide tensional links from the mandible to structures surrounding it; and although only a small set of these has been traditionally associated with the TMJ there are others that can be functionally related to it from a different perspective (Fig. 2). Muscles, ligaments and fascia are always under tension in-vivo (Levin, 1982, 2002; Masi and Hannon, 2008; Van der Wal, 2009) and must therefore be contributing to the kinematics of the mandible. This broad structure is attached to the root of the zygomatic process (temporal) and descends posteriorly to attach to the lateral surface and posterior border of the condylar neck; a short horizontal band also connects to the lateral pole of the condyle and prevents posterior displacement of the resting condyle. This flat band descends laterally from the spine of the sphenoid and widens as it reaches the lingula of the mandible (Garg and Townsend, 2001). The fibres are conventionally considered to be slack when the jaw is in the resting position and only become taut as the mouth is opened (Standring, 2005 p 526); but this view should be considered alongside the previous comment on ligamentous tension in-vivo. The ligament also carries fibres from the anterior malleolar ligament (middle ear) and may be involved in the causation of TMJ related tinnitus (Burch, 1966; Ramirez et al. 2009). A thickened band of deep cervical fascia that stretches down and laterally from the temporal styloid process to the angle and posterior border of the mandible. Standring (2005 p 527) asserts that “its position and orientation indicate that it cannot mechanically constrain any normal movements of the mandible and does not seem to warrant the status of a ligament of the joint”, but a re-assessment from a different perspective will suggest that it plays an important role in mandibular motion (Levin, 2002, 2006). Although motion of the TMJ is frequently considered in isolation, the hyoid bone is an essential part of its mechanics and its connections deserve highlighting at an early stage. The stylo-hyoid ligament is a fibrous cord that links the hyoid bone with the styloid process and also provides an attachment for the middle constrictor muscle (Standring, 2005 p 538). This is a thickened sheet within the deep cervical fascia that consistently connects the angle of the mandible with varying parts of the stylo-hyoid ligament as far as the hyoid bone (Standring, 2005 p 499). Although it was not recognized in older textbooks (Williams and Warwick, 1980) the orientation and force transfer properties of this ligament may be of major importance to TMJ physiology. When describing a joint, it is usual to mention the muscles that cause a particular movement, followed by their antagonists and ‘accessories’, although these are rather disingenuous distinctions (Huijing and Baan, 2008) (Fig. 2). Whilst the temporalis, masseter and medial pterygoid muscles generate the greatest amount of force in closing the mouth, they are generally referred to as the ‘elevators’ (abductors) and widely considered to counter the effect of gravity. The geniohyoid, mylohyoid and digastric are then the ‘depressors’ (adductors) that open it; the lateral and medial pterygoids are the forward ‘protruders’ and collateral movers; and posterior temporalis, digastric, geniohyoid and mylohyoid are the ‘retractors’. However, although gravity undoubtedly has an influence, these muscles function much the same with the body in any position; and although mandibular motion is usually related to the standard anatomical planes, such characterization disguises the synergistic relationships between them. Each muscle pulls in a direction that is parallel with its contractile fibres, or aponeurosis in the case of pennate muscles (mylohyoid etc), but its resulting line of action is influenced by all the others. For example, the masseters and medial pterygoids pull the mandible anteriorly and superiorly, with the first also pulling it outward and the second pulling inwards, and the bulk of temporalis pulls superiorly; the lateral pterygoids pull the condyles forward and outwards, and balance the backward pull of the posterior temporalis fibres (Murray et al., 2001); and the combined influence of the lateral pterygoid and contra-lateral medial pterygoid move it from side to side; and together with the geniohyoid, mylohyoid and anterior digastric, guide the direction of motion and/or chewing force. The mandible thus operates within a wide spatial field (Hiraba et al. 2000; Schindler et al. 2006) with all muscles contributing to placing the mandible in any particular position during movement (Pileicikiene and Surna, 2004). Muscles are essentially bundles of myofibres enclosed within a complex hierarchy of connective tissues (Scarr, in press), with each myofibre containing a series of contractile sarcomeres and regular arrangements of myofilaments (actin and myosin) that influence their contractile characteristics. Slight variations in myosin structure produce different types of myofibres that collectively influence motor unit size, contraction velocity and tetanic force (Van Eijden and Turkawski, 2001; Grünheid et al. 2009). Considerable variation in the arrangement and proportions of these different fibre types within ‘jaw’ muscles means that these become versatile entities that can readily adapt to altered functional demands and perform a much larger variety of motor tasks than those in the limbs and trunk; but as this variation is dependent on the normal loading pattern of a particular muscle and individual, meaningful comparisons with other skeletal muscles and TMJ pathologies becomes complicated (Grünheid et al. 2009). The masticatory apparatus is thus a kinematically and mechanically indeterminate system, with the complex architecture of these muscles contributing to the great variation in motor activity and adaptability to changing functional demands (Grünheid et al. 2009; Hiraba et al. 2000; Murray et al. 2001). While higher centres within the brain initiate and regulate purposeful movements, they are dependent on a huge amount of sensory information from the TMJ, tongue, periodontal, pharyngeal and laryngeal tissues, and associated muscles, ligaments and fascia, which means that the number of factors involved in even the simplest of movements soon becomes enormous (Renton and Egbuniwe 2015; Turvey and Fonseca, 2014; Yin et al. 2007) and that any meaningful analysis must substantially reduce them to a manageable level (Koolstra, 2003; Pileicikiene & Surna 2004); and there has lain the problem. At first glance, the mechanism of action of the TMJ’s would seem to be quite clear, with the mandibular condyles pressing the disc against the temporal articular surfaces and rotating and sliding forwards during mouth opening; but things are not that simple. Lateral movements are also essential to chewing, speech and facial expression (Korioth and Hannam, 1994), and the application of increased force to one side of the dentition during biting means that the condyles must behave differently from each other (Hylander, 1979), even though they are linked through the symphysis (Daegling 2012). Various intra-osseous strains appear as the result of relative changes in condylar position (Aparna et al. 2011; Hylander, 1979), with theoretical finite element modelling (FEM) demonstrating a concentration of stresses around the symphyseal region (Al-Sukhun & Kelleway, 2007). 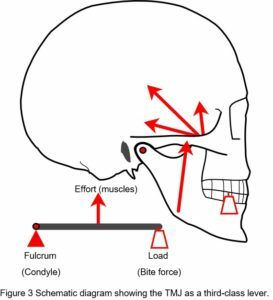 FEM is now widely used to analyse the behaviour of the TMJ and predicts the stresses and strains on their surfaces and within (Koolstra, 2003). It has been used in estimating the stresses induced in the disc (Commisso et al. 2014; Li et al. 2014), condylar cartilage (Singh and Detamore, 2009), teeth (Sellers and Crompton, 2004), muscles (Kijak et al. 2015; Röhrle and Pullan, 2007), soft-tissues (Freutel et al, 2014) and mandible (Al-Sukhun and Kelleway, 2007; Ingawalé and Goswami, 2012; Korioth and Hannam, 1994) during loading and movement. Basically, each structure under examination is divided into a number of different regions, with each one given a set of values that correspond to certain (frequently estimated) mechanical properties, and the large number of computed interactions between them producing a theoretical model that can be compared with other experimental data. Such mathematical modelling is based on the predictable rules of classical mechanics and linear stress-strain relationships, but should always be treated with caution in a biological context (Koolstra, 2003; Singh and Detamore, 2009). Electromyography does not provide direct information on muscle loading, cannot record resting muscle tone and is technically very difficult (Hiraba et al. 2000; Masi and Hannon, 2008); the use of bi-refringent materials to analyse the stress-patterns generated on bone loading is unable to take account of the heterarchical complexity of lamellar bone (Standlee et al. 1977); biological structures typically display non-linear stress/strain relationships that do not follow the rules of classical mechanics (Humphrey, 2003); and cadaver experiments cannot produce the same results as living tissues. Many assumptions must thus be made in setting up the experimental parameters and formulae that relate them to each other, and the true value of mathematical analysis to the alleviation of TMJ symptomatology remains unclear. For example, Standring (2005 p 526) asserts that: “There is… irrefutable theoretical evidence based on Newtonian mechanics that the jaw joint is a weight-bearing joint… (Osborn, 1995)”, which implies that classical theory should be considered as standard. However, Osborn (1995) actually stated that “…the model manipulated muscle activity so that the condyle could not be pulled away from the temporal bone”, which indicates that the ‘irrefutable theoretical evidence’ was a foregone conclusion determined by the particular experimental conditions; and illustrates the point that such analysis is capable of producing whatever result is desired. Although many authors clearly recognize the concerns described above and a considerable amount of information that would be otherwise unavailable has been amassed, the overall impression is that theoretical analysis and the acquisition of ‘just a bit more data’ will ultimately provide the relevant answers (Singh and Detamore, 2009; Tanaka and Koolstra, 2008), but there are also other matters that must be considered. The issue of compressive loading on the disc and articular surfaces was debated throughout much of the twentieth-century and considered important to understanding the aetiology of TMJ disorders and subsequent therapeutic procedures, but until the 1970’s direct in-vivo measurements seemed to be practically impossible. Although the TMJ is widely considered to operate as a third-class lever system, an idea proposed by Borelli in 1680 (Ethier and Simmons, 2007), this view is overly simplistic and controversial (Levin, 2002) (Fig. 3). Lever systems generate potentially damaging stress concentrations that would be likely to cause material fatigue if they appeared in developing tissues (Levin, 2002; Salvadori, 2002 p. 84) (and that really would be the end of them) and a moving fulcrum dramatically complicates their control (Turvey and Fonseca, 2014). Wilson (1921) was one of the first to suggest that the joint does not normally work as a lever (and is therefore not compressed) by considering the resultant mouth-closing muscle forces as acting perpendicular to the occlusal plane, where only the loss of posterior teeth would produce reaction forces in the joint and lead to disc degeneration. He also noted that up to three-quarters of the muscular effort would be wasted in a lever system. Gysi (1921) countered these ideas by constructing a bi-condylar lever model of the mandible and showed that the reaction forces appearing at each joint could be shared and vary according to which tooth coincided with the resultant line of muscle action, with unilateral biting increasing reaction forces in the contra-lateral joint and reducing them on the same side. Robinson (1946) later questioned the resiliency of the fibro-cartilage and ability of the paper-thin bone in the middle of the glenoid fossa (Fig. 1) to withstand significant compressional forces, suggesting that the temporalis, masseter and medial pterygoid muscles could control the mandible through reflex nerve activity and avoid joint reaction forces. Frankel and Burstein (1971) also described muscle forces as acting on the dentition alone and that did not involve the joint; while Gingerich (1971) emphasized the importance of temporalis and condylar translation in efficiently avoiding reaction forces by considering the mandible as a ‘link’ in the mechanical transfer of force vectors from muscles to teeth. Hylander (1975) then reviewed all the above (and more) and essentially demolished the non-lever arguments based on what he considered as inaccurate anatomical descriptions and faulty force vector analysis, but did acknowledge that the mandibular lever was still only a hypothesis. While Gingerich (1979) partly accepted the lever explanation, Hylander (1979) later analysed the patterns of sub-condylar bone strain that could be expected in joints that were loaded under compression (lever model) or had no reaction forces (non-lever), and noted that “it is theoretically possible to have little or no sub-condylar strain with no TMJ reaction force…” under certain circumstances. Using Macaque monkeys (Macaca spp) with strain gauges surgically implanted on the lateral sub-condylar bone surface to measure bone strain during mastication, Hylander (1979) thus found experimental support for his theoretical analysis and suggested that the articular surfaces are generally loaded in compression, but also noted that the “TMJ has either very little compressive stress, no stress, or it is loaded in tension” when biting occurs on the ipsilateral third molar. Brehnan et al. (1981) then appeared to resolve the matter by implanting pressure-sensitive foil (9 microns) onto the condylar articular surfaces of Macaca arctoides and measured loads of 3-4 lb (1.36-1.80 Kg) during incisal biting and 1-3 lb (0.50-1.36 Kg) with molar chewing. This was thus the first study to measure loads directly across the articulating surfaces of the TMJ in a mammal, but a closer inspection of the experimental procedure reveals some disturbing details. “…a horizontal incision was made along the zygomatic arch… from one to… [one and a half] inches. The attachment of the TMJ capsule was cut from the zygomatic arch…, the lateral attachments of the meniscus on the neck of the condyle were cut… and the TMJ was slightly subluxated” (Brehnan et al. 1981). No mention was made about the restoration of these tissues and it was noted that “…recordings were taken six hours post-surgery and daily for five days… and recordings were only successful on one monkey”. These experiments are frequently cited as definitive evidence that the TMJ is heavily loaded in compression (Korioth and Hannam, 1994; Tanaka and Koolstra, 2008), yet the extent to which these surgically traumatized tissues can be considered as behaving ‘normally’ would seem to be a question that is so incredulous that it deserves no further consideration. Even if the zygomatic arch, capsule and skin etc. were restored perfectly, which seems unlikely, the loss of proprioceptive and haptic information (Turvey and Fonseca, 2014) (and altered muscle reflex activity) and natural consequences of wound healing (inflammation, oedema etc) would inevitably alter the mechanics of the joint (Fricton, 2004; Hylander, 1979). These are important issues that appear to have been overlooked, and although Taylor (1986) later described normal changes in bone contour within the joint that were not consistent with the lever model, the reliability of these experiments has been accepted to such an extent that they have become the benchmark of functional descriptions of the joint (Standring, 2005 p 526). How much loading is normal? It is now generally accepted that the normal TMJ is loaded under compression, and indeed, Tanaka and Koolstra (2008) observed that “mechanical loading is essential for the growth, development and maintenance of living tissues” and that unloading can suppress bone remodelling, but they also noted that excessive and even ‘normal’ stresses on the joint can lead to degenerative changes within the articular structure. Although the symptoms associated with TMJ disorders can often be correlated with demonstrable pathology, this is not always the case as even ‘healthy’ individuals can display apparent pathological changes without symptoms (Salé et al. 2013), and the question of how much loading should be considered ‘normal’ within any particular joint remains unanswered. The compression of synovial joint surfaces is an inevitable consequence of the classical lever model, and a causative factor in disc degeneration (Juran et al. 2013; Wright et al. 2013) and the development of some TMJ pathologies, and the recognition that compression might be actively regulated during movement is an alternative view that has profound implications. To reiterate, current biomechanical theory does not have a satisfactory model that enables synovial joint surfaces to be actively and routinely decompressed (or ‘pulled apart’) and a re-examination of why this should be the case raises some important issues. The Italian Renaissance witnessed a dramatic increase in knowledge, and Vesalius (1514-1564) as professor of anatomy and surgery made discoveries that overturned the dominant but erroneous wisdom that had prevailed since the time of Galen (c129-c200 CE), to become what is now recognized as the cornerstone of anatomical knowledge (Rifkin et al., 2006 p 14). The mathematician Borelli (1608-1679) then compared human structures with man-made machines of the day and wrote a treatise that has become the basis for modern biomechanical theory (Ethier and Simmons, 2007). The principles underlying human movement have thus been based on a system of classic ‘laws’ that developed out of observations made by Galilei (1564-1642), Hooke (1635-1703) and Newton (1642-1727), amongst others, and describe what happens when an object is acted on by physical forces (Humphrey, 2003); but they were discovered through experiments with inanimate objects and it has always been assumed that the ‘odd’ behaviour of living organisms was something that would eventually ‘fall into place’, or that could be conveniently ignored (Lighthill, 1986). Biological tissues are not constrained by the rules of classical theory, and their mechanics follow more complex non-linear stress-strain relationships that allow them to operate quite differently from their lifeless counterparts (Ewoldt, 2014; Humphrey, 2003; Levin, 1982, 2006). Even though the introduction of more powerful computers now enables the mechanics of tissues with non-linear properties to be more realistically examined, their experimental protocols are still essentially based on the classical principles that govern the behaviour of columns, beams and levers (Freutel et al, 2014; Levin, 2002, 2006; Tanaka and Koolstra, 2008). While orthodox biomechanical theory dictates that the disc must be compressed between the articular surfaces, so the (unproven) assertion that it does behave like this has been used to justify the lever (Hylander, 1979; Standring, 2005; Tanaka and Koolstra, 2008), and it is considered that the consequences of this circular reasoning have hindered real progress in understanding the aetiology and treatment of TMJ disorders. There is nothing wrong with classical mechanics but its usefulness in describing the properties of living tissues is both limited and contrived (Levin, 2002; Lighthill, 1986); and there is now an alternative way of understanding the temporo-mandibular joint. The biotensegrity concept is based on the rules of physics first and from which everything else is derived (Levin, 1982, 2006; Scarr, 2014); and thus escapes the controversies surrounding the TMJ by revealing the flaws in current biomechanical theory. It has already been described in the shoulder (Levin, 1997), elbow (Scarr, 2012) spine (Levin, 2002), cranium (Scarr, 2008), pelvis (Levin, 2007; Pardehshenas et al. 2014), knee (Hakkak et al. 2015) and cellular architecture (Huang et al, 2006; Ingber et al, 2014) etc. Biotensegrity is a structural design principle in biology that considers bones as compressional elements suspended within a global network of tensioned muscles, ligaments and fascial tissues, and that enables the structure itself to control complex mandibular movements and decompress the joint. A paper to follow will then provide a more complete explanation of biotensegrity principles and develop a new model of mandibular physiology that can be used to guide future research. The basic anatomy of the temporo-mandibular joint has been described along with some of the problems and controversies that have surrounded it, where it was considered that the rigid application of classical mechanics to explaining joint physiology has limited our understanding of its pathologies. The lever model survived for so long because no-one had really come up with a better explanation for the things that could be observed but there is now an alternative approach to understanding mandibular motion. The biotensegrity model escapes the controversies that have surrounded TMJ function and is a completely different way of looking at joint mechanics. It is based directly on the rules of physics first and from which everything else is derived and thus provides a more complete picture of temporo-mandibular physiology. Al-Sukhun, J., Kelleway, J., 2007. Biomechanics of the mandible: part II. Development of a 3-dimensional finite element model to study mandibular functional deformation in subjects treated with dental implants. Int. J. Oral. Maxillofacial. Implants. 22, 455-466. Anthwal, N., Joshi, L., Tucker., A.S. 2013. Evolution of the mammalian middle ear and jaw: adaptations and novel structures. J. Anat. 222, 147-160. Aparna, I.N., Dhanasekar, M., Gupta, L., Lingeshwar, D., 2011. Medial mandibular flexure: a review of concepts and consequences. Inter. J. Oral. Implant. Clin. Res. 2, 67-71. Bag, A.K., Gaddikeri, S., Hardin, S., Tran, B.D., Midina, J.A., Curé, J.K., 2014. Imaging of the temporo-mandibular joint: an update. World. J. Radiol. 6, 567-582. Boyd, R.L., Gibbs, C.H., Mahan, P.E., Richmond, A.F., Laskin, J.L., 1990. Temporomandibular joint forces measured at the condyle of Macaca arctoides. Am. J. Orthod. Dentofac. Orthop. 97, 472-479. Brehnan, K., Boyd, R.L., Laskin, J., Gibbs, C.H., Mahan, P., 1981. Direct measurement of loads at the temporo-mandibular joint in Macaca Artoides. J. Dent. Res. 60, 1820-1824. Burch, J.G., 1966. The cranial attachment of the sphenomandibular (tympanomandibular) ligament. Anat. Rec. 156, 433-437. Christo, J.E., Bennett, S., Wilkinson, T.M., Townsend, G.C., 2005. Discal attachments of the human temporomandibular joint. Aust. Dent. J. 50, 152-160. Commisso, M.S., Martínez-Reina, J., Mayo, J., 2014. A study of the temporo-mandibular joint during bruxism. Int. J. Oral. Sci. 6, 116-123. Cuccia, A.M., Caradonna, C., Caradonna, D., 2011. Manual therapy of the mandibular accessory ligaments for the management of temporo-mandibular joint disorders. J. Am. Osteo. Assoc. 111, 102-112. Daegling, D.J., 2012. The human mandible and the origins of speech. J. Anthropol. 2012, 1-14. Detamore, M.S., Athanasiou, K.A., Mao, J., 2007. A call to bioengineers and dental professionals: directives for the future of TMJ bioengineering. Ann. Biomed. Eng. 35, 1301-1311. Dommerholt, J., 2006. Myofascial pain syndrome in the craniomandibular region, published as: ‘El syndrome de dolor miofasical en la region craneomandibular, in: Serrat, P., (Ed. ), Bases diagnosticas, terapeuticas y posturales del functionalism craniofacial, Madrid, Ripano 564-581. Available online [in English]: http://www.bethesdaphysiocare.com/professionals/pdf/book_craniomandibularMPS.pdf accessed 03/12/2015. Ethier, C.R., Simmons, C.A., 2007. Introductory biomechanics: from cells to organisms, Cambridge University Press, Cambridge. Ewoldt, R.H., 2014. Extremely soft: design with rheologically complex fluids. Soft Robotics. 1, 12-20. Frankel, V.H., Burstein, A.H., 1971. Orthopaedic biomechanics, Lea and Febiger, Philadelphia. Freutel, M., Schmidt, H., Dürselen, L., Ignatius, A., Galbusera, F., 2014. Finite element modelling of soft tissues: material models, tissue interaction and challenges. Clin. Biomech. 29, 363-372. Fricton, J.R., 2004. Temporomandibular muscle and joint disorders. Pain. 12, 1-6. Fricton, J.R., 2014. Temporomandibular disorders: a human systems approach. J. Calif. Dent. Assoc. 42, 523-534. Garg, A., Townsend, G., 2001. Anatomical variation of the sphenomandibular ligament. Aust. Endod. J. 27, 22-24. Gingerich, P.D., 1971. Functional significance of mandibular translation in vertebrate jaw mechanics. Postilla. 152, 1-10. Gingerich, P.D., 1979. The human mandible: lever, link or both? Am. J. Phys. Anthrop. 51, 135-138. Grünheid, T., Langenbach, G.E.J., Korfage, J.A.M., Zentner, A., Van Eijden, T.M.G.J., 2009. The adaptive response of jaw muscles to varying functional demands. Eur. J. Orthod. 31, 596-612. Gysi, A. 1921., Studies on the leverage problem of the mandible. Dent. Digest, 27, 74-84., 144-150., 203-208. Hakkak, F., Jabalameli, M., Rostami, M., Parnianpour, M., 2015. The tibiofemoral joint gaps – an arthroscopic study. Sift Desk Research Page J. Biomed. Engin. 1, 1-6. Hill, A., Duran, J., Purcell, P., 2014. Lubricin protects the temporomandibular joint surfaces from degeneration. PLOS ONE. 9, e106497. Hiraba, K., Hibino, K., Hiranuma, K., Negoro, T., 2000. EMG activities of two heads of the human lateral pterygoid muscle in relation to mandibular condyle movement and biting force. J. Neurophysiol. 83, 2120-2137. Huang, S., Sultan, C., Ingber., 2006. Tensegrity, dynamic networks and complex systems biology: emergence in structural and information networks within living cells; in Deisboeck, T., Kresh, T., Yasha, J., (Eds), Complex systems science in biomedicine, Springer, 283-310. Huijing, P.A., Baan, G.C., 2008. Myofascial force transmission via extramuscular pathways occurs between antagonistic muscles. Cell. Tiss. Org. 188, 400-414. Humphrey, J.D., 2003. Continuum biomechanics of soft biological tissues. Proc. R. Soc. Lond. A. 459, 3-46. Hylander, W.L., 1975. The human mandible: lever or link? Am. J. Phys. Anthrop. 43, 227-242. Hylander, W.L., 1979. An experimental analysis of temporo-mandibular joint reaction force in Macaques. Am. J. Phys. Anthrop. 51, 433-456. Ingawalé, S., Goswami, T., 2009. Temporomandibular joint: disorders, treatments and biomechanics. Ann. Biomed. Eng. 37, 976-996. Ingber, D.E., Wang, N., Stamenović, D., 2014. Tensegrity, cellular biophysics and the mechanics of living systems. Rep. Progr. Phys. 77, 046603. Juran, C.M., Dolwick, M.F., McFetridge, P.S., 2013. Shear mechanics of the TMJ disc: relationship to common clinical observations. Biomat. Bioeng. 92, 193-198. Kijak, E., Margielewicz, J., Gąska, D., Lietz-Kijak, D., Więckiewicz, W., 2015. Identification of mastication organ muscle forces in the biocybernetic perspective. Bio. Med. Res. Int. 436595 1-11 Available online: http://www.hindawi.com/journals/bmri/2015/436595/ accessed 03/12/2015. Koolstra, J.H., 2003. Number crunching with the human masticatory system. J. Dent. Res. 82, 672-676. Korioth, T.W.P., Hannam, A.G., 1994. Mandibular forces during simulated tooth clenching. J. Orofac. Pain. 8, 178-188. Levin, S.M., 1982. Continuous tension, discontinuous compression: a model for biomechanical support of the body. Bull. Struct. Integr. 8., available online http://www.biotensegrity.com/continuous_tension_discontinuous_compression.php accessed 3/12/2015. Levin, S.M., 1997. Putting the shoulder to the wheel: a new biomechanical model for the shoulder girdle. J. Biomed Sci Instru 33, 412-417. Levin, S.M., 2002. The tensegrity truss as a model for spine mechanics: biotensegrity. J. Mech. Med. Biol. 2, 375-388. Levin, S.M., 2006. Tensegrity: the new biomechanics, in: Hutson, M., Ellis, R., (Eds. ), Textbook of musculoskeletal medicine, Oxford University Press, Oxford, pp. 69-80. Levin, S.M., 2007. A suspensory system for the sacrum in pelvic mechanics: biotensegrity. In: Vleeming, A., Mooney, V., Stoekart, R., (Eds), Movement, stability and lumbopelvic pain. 2nd edn. Edinburgh., Elsevier, 229-237. Li, Q., Ren, S., Ge, C., Sun, H., Lu, H., Duan, Y., Rong, Q., 2014. Effect of jaw opening on the stress pattern in a normal human articular disc: finite element analysis based on MRI images. Head. Face. Med. 10, 1-9. Lighthill, J., 1986. The recently recognized failure of predictability in Newtonian dynamics. Proc. Roy. Soc. Lond. A. 407, 35-50. Luce, C.E., 1889. The movements of the lower jaw. Boston. Med. Surg. J. 121, 8-11. Masi, A.T., Hannon, J.C., 2008. Human resting muscle tone (HRMT): narrative introduction and modern concepts. J. Bodyw. Mov. Thera. 12, 320-332. Murphy, M.K., Arzi, B., Hu, J.C., Athanasiou, K.A., 2013. Tensile characterization of porcine temporomandibular joint disc attachments. J. Dent. Res. 92, 753-758. Murray, G.M., Phanachet, I., Uchida, S., Whittle, T., 2001. The role of the human lateral pterygoid muscle in the control of horizontal jaw movements. J. Orofac. Pain. 15, 279-305. Osborn, J.W., 1995. 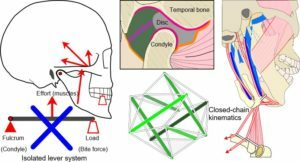 Biomechanical implications of lateral pterygoid contribution to biting and jaw opening in humans. Archs. Oral. Biol. 40, 1099-1108. Pardehshenas, H., Maroufi, N., Sanjari, M.A., Parnianpour, M., Levin, S.M., 2014. Lumbopelvic muscle activation patterns in three stances under graded loading conditions: proposing a tensegrity model for load transfer through the sacroiliac joints. J. Bodyw. Mov. Thera. 18, 633-642. Pileicikiene, G., Surna, A., 2004. The human masticatory system from a biomechanical perspective: a review. Stomatologija, Baltic. Dent. Maxillofac. J. 6, 81-84. Ramírez, L.M., Ballesteros, A.L.E., Sandoval, O.G.P., 2009. A direct anatomical study of the morphology and functionality of disco-malleolar and anterior malleolar ligaments. Int. J. Morphol. 27, 367-379. Renton, T., Egbuniwe, O., 2015. Pain. part 2a: trigeminal anatomy related to pain. Dent Update. 42, 238-244. Rifkin, B.A., Ackerman, M.J., Folkenberg, J., 2006. Human anatomy: a visual history from the Renaissance to the digital age, Abrams, New York. Robinson, A.B., 1946. The temporomandibular joint: theory of reflex controlled nonlever action of the mandible. J. Am. Dent. Assoc. 33, 1260-1271. Röhrle, O., Pullan, A.J., 2007. Three-dimensional finite element modelling of muscle forces during mastication. J. Biomech. 40, 3363-3372. Salé, H., Bryndahl, F., Isberg, A., 2013. Temporomandibular joints in asymptomatic and symptomatic nonpatient volunteers: a prospective 15-year follow-up clinical and MR imaging study. Radiol. 267, 183-194. Salvadori, M., 2002. Why buildings stand up: the strength of architecture. W. W. Norton & Company, Inc., New York. Scarr, G., 2008., A model of the cranial vault as a tensegrity structure and its significance to normal and abnormal cranial development. Int. J. Osteo. Med. 11, 80-89. Scarr, G., 2012., A consideration of the elbow as a tensegrity structure. Int. J. Osteo. Med. 15, 53-65. Scarr, G., 2014., Biotensegrity: the structural basis of life. Handspring, Pencaitland. Scarr, G., (in press) Fascial hierarchies and the relevance of crossed-helical arrangements of collagen to changes in the shape of muscles. J. Bodyw. Mov. Thera. Schindler, H.J., Rues, S., Tὑrp, J.C., Lenz, J., 2006 Heterogeneous activation of the medial pterygoid muscle during simulated clenching. Arch. Oral Biol. 51, 498-504. Sellers, W.I., Crompton, R.H., 2004. Using sensibility analysis to validate the predictions of a biomechanical model of bite forces. Ann. Anat. 186, 89-95. Singh, M., Detamore, M.S., 2009. Biomechanical properties of the mandibular condylar cartilage and their relevance to the TMJ disc. J. Biomech. 42, 404-417. Sinno, H., Tahiri, Y., Gilardino, M., Bobyn, D., 2010. Engineering alloplastic temporomandibular joint replacements. McGill J. Medic. 13, 63-72. Standlee, J.P., Caputo, A.A., Ralph, J.P., 1977. Stress trajectories within the mandible under occlusal loads. J. Dent. Res. 56, 1297-1302. Standring, S., 2005. Gray’s anatomy, thirty-ninth ed, Elsevier Churchill Livingstone, Edinburgh. Tanaka, I., Van Eijden, T., 2003. Biomechanical behaviour of the temporomandibular joint disc. Crit. Rev. Oral Biol. Med. 14, 138-150. Tanaka, I., Koolstra, J.H., 2008. Biomechanics of the temporomandibular joint. J. Dent. Res. 11, 989-991. Tanaka, I., Detamore, M.S., Tanimoto, K., Kawai, N., 2008. Lubrication of the temporomandibular joint. Ann. Biomed. Eng. 36, 14-29. Taylor, R.M.S., 1986. Nonlever action of the mandible. Am. J. Phys. Anthrop. 70, 417-421. Turvey, M.T., Fonseca, S.T., 2014. The medium of haptic perception: a tensegrity hypothesis. J. Mot. Behav. 46, 143-187. Van der Wal, J., 2009. The architecture of the connective tissue in the musculoskeletal system – an often overlooked functional parameter as to proprioception in the locomotor apparatus. Int. J. Ther. Massage. Bodywork. 2, 9-23. Van Eijden, T.M.G.J., Turkawski, S.J.J., 2001. Morphology and physiology of masticatory muscle motor units. Crit. Rev. Oral. Biol. Med. 12; 76-91. Wilkinson, T.M., Crowley, C.M., 1994. A histologic study of retrodiscal tissues of the human temporomandibular joint in the open and closed position. J. Orofac. Pain. 8, 7-17. Williams, P.L., Warwick, R., 1980. Gray’s anatomy, thirty-sixth ed, Churchill Livingstone, Edinburgh. Wilson, G.H., 1921. The anatomy and physics of the temporomandibular joint. J. Nat. Dent. Assoc. 8, 236-241. Woda, A., Pionchon, P., Palla, S., 2001. Regulation of mandibular postures: mechanisms and clinical implications. Crit. Rev. Oral. Biol. Med. 12, 166-178. Wright, G.J., Juo, J., Shi, C., Bacro, T.H., Slate, E.H., Yao, H., 2013. Effect of mechanical strain on solute diffusion in human TMJ discs: an electrical conductivity study. Anns. Biomed. Eng. 41, 1-18. Yin, C.S., Lee, Y.J., Lee, Y.J., 2007. Neurological influences of the temporomandibular joint. J Bodyw Mov Ther 11: 285-294.